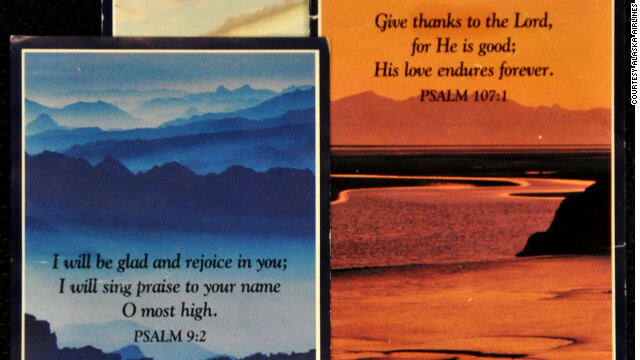 Alaska Airlines distributed prayer cards like these on flights for more than 30 years. (CNN) - Passengers on Alaska Airlines will no longer get a free Psalm with their meal. On Wednesday, the airline announced it is ending its more than 30-year tradition of including printed cards with short Bible verses during meal service. The cards have been distributed on trays with Alaska Airlines meals since the 1970s, according to airline spokeswoman Bobbie Egan. Since 2006, only passengers in First Class on longer Alaska Airlines flights have been served meals, so only a small percent of passengers received a card. “We have been keeping track over the recent years and we are receiving more complaints than compliments” says Egan. Between 1998 and 2002 they received 242 complaints and 141 compliments about the cards. The idea to distribute the cards in the first place came from a marketing executive who borrowed the idea from another carrier as a way to differentiate Alaska’s service, according to the airline’s statement. But that view has now changed. “A business that aspires to be diverse and inclusive shouldn't have a religious agenda. Religious beliefs are deeply personal and vary greatly among our customers” Egan said in an emailed statement. The decision to eliminate the cards was made last fall, she says, and takes effect on February 1. No decision yet about what to do with the leftovers. You have to waste less time to explore your necessary topic on internet, as today the searching strategies of search engines are fastidious. Thatis why I fount this paragraph at this time. I've recently tsrated a web site, the information you offer on this web site has helped me tremendously. Thank you for all of your time & work. It is no use saying, We are doing our best.' You have got to succeed in doing what is necessary. by Sir Winston Churchill. I must show my affection for your snkdiens giving support to individuals who really want guidance on this one question. Your personal dedication to passing the message up and down was incredibly advantageous and have constantly helped men and women like me to arrive at their pursuits. Your amazing interesting report means a great deal to me and still more to my peers. Regards; from each one of us. That is a huge compliment! They are one of my raovfite magazines. Hope it brings a great new crop of simple-living, creative and hip gardeners your way. I wonder If this has anything to do with the fact that Emirates are due to start flying Into Seattle March 1st, Alaska would hate to offend any muzzlims, who knows what It could lead to ? We should all send them a quick email thank you note. Public businesses get complaints perhaps 20 times more often than compliments; it will be noticed. Not a horrible idea at all. "I appreciate that you took the time to contact Alaska Airlines with regard to the discontinuation of our prayer cards. We appreciate you taking the time to share your thoughts with us regarding the removal of prayer cards from our aircraft. We know that this decision is near and dear to the hearts of our customers and employees alike. We have received both positive and negative feedback regarding this issue. We would like to thank you for your comments and feedback as they are important to us." Now what will I wipe my a ss with? thank you AA! Very wise decision. I found the cards mildly offensive. Passengers are a captive audience and I saw the cards as an attempt to convert or persuade people towards religion. I stopped flying Alaska Airlines because of those cards. I chose SouthWest for my flights because they were not promoting any religion. Another small step by our species away from primitive superst.itions. Now let's get all Bibles and Books of Mormon out of hotel rooms and replace them with "The Origin of Species" and Dawknin's "The God Delusion". Yes, and while we are at it, let us destroy all churches, mosques, and temples. Ditto for houses of "worthless worship" aka mosques, churches, basilicas, cathedrals, temples and synagogues as they become the empty shells that they always were. "Yes, and while we are at it, let us destroy all churches, mosques, and temples."